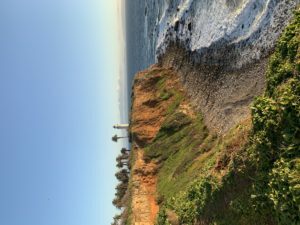 Just over 13,500 people reside in Palos Verdes Estates, a city in Los Angeles County located on the gorgeous coastline of the Pacific ocean. Immaculate luxury homes fill the 81st richest city in the U.S., where the average home price is about $1.8 million dollars. And while the city is filled with the most exquisite things that life offers, termites are still a threat to these luxurious properties. Don’t assume that termites affect only nearby cities and homes and find yourself with a big problem on your hands. Search for ‘pest control near me’ from your PC or smartphone and schedule an annual inspection to keep this pest far away from your home. What is Termites Preventative Maintenance? Preventative maintenance keeps termites away from your home. Preventing this pest is much easier than treating it. Did you know that one termite colony can hold as many as two million termites? That’s a lot of pests eagerly eating away at the cellulose found in decaying wood in and around the home. 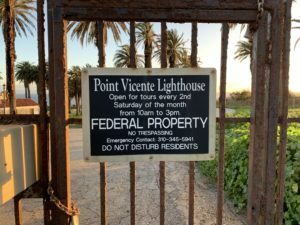 In a city like Palos Verdes Estates, the risk of a termites infestation is also greater than the risk in other areas of L.A. due to the proximity of the ocean. Even a tad bit of water can damage wood and termites can smell the decay from miles away. The pest will not hesitate to make your home it’s very own, no invitation needed. Trained termite technicians come out and inspect every square inch of the home. Many people don’t realize that termites burrow deep within the structure of the home, where they can live unnoticed for many months. Termite technicians have the tools that allow them to inspect deep within the structure to ensure that no termites exist. If a problem is discovered, the technician alerts you of the problem and, if you choose, treatment can begin. The termites’ inspection helps prevent the destruction of your home, whether you want to keep termites away or want to treat a problem. What’s the Big Deal About Termites? Termites are small, measuring only about ⅜” in length. But, they cause massive damage in a very short period of time. You can’t really blame the termite; it’s only doing what nature taught. But, when you’re left with so much destruction, it’s really hard to think of the termite as anything aside from annoying pests. It takes only a matter of weeks for termites to cause thousands of dollars worth of damage and a few short months to totally destroy your home. You’ve worked far too hard to allow this to happen. Pest control companies ensure that you are not faced with this obstacle. You shouldn’t hesitate to pick up that phone to call our termites experts. We’d love to help you learn more about our services. 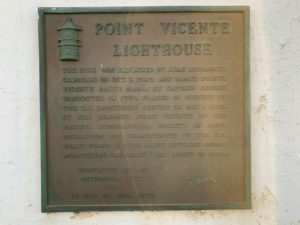 But, it’s not only the house that can experience a termites infestation. Your garage, patio, deck, and exterior wood surfaces are also at risk of an infestation. These items may not hold the same value as the actual home itself but are nonetheless important parts of your home that you want to maintain. 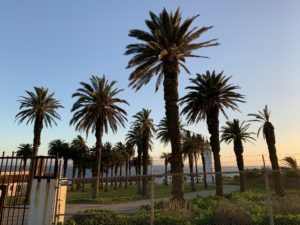 Be sure to call one of the great termites companies in the Palos Verdes Estates area to schedule preventive maintenance – or treatment if you suspect there is a problem – and leave your worries behind. Yes, there are a few types of termites that threaten to cause damage and destruction to your home. Each type of termite eats the cellulose out of the wood of your home, but each has its own means of destroying your home and cause trouble. Palos Verdes Estates, CA homeowners are faced with three different types of termites that can infest their homes. This is the drywood termite, dampwood termite, and the subterranean termite. But, its a sub-species of termite that causes the most concern. This termite is known as the Formosan termite. This termite doesn’t need soil to survive like some of the other species. Instead, they build colonies within the structure of the home. Termites are present in California throughout the year so homeowners must always be on guard to ensure that the pest doesn’t cause them trouble. However, fall is the most common season for this pest to cause trouble. Many factors affect the season that termites are at their worst, however, such as temperatures, the condition of the home, dryness and humidity levels, and more. The best way to keep things under control is with that preventative maintenance service we’ve talked so much about here. This is a truly awesome service that no homeowner should be without. What are the Best Termite Companies Near Me? When you search termite companies near me and stumble upon our name, you’re already halfway to successful pest control treatment. We’re the trusted name in termites treatment in the Palos Verdes Estates area, offering homeowners top-notch treatment and prevention services that provide peace of mind and assurance in a pest-free home. We’ve served the area for many years now and bring professionalism and expertise to every job. Most importantly, we also bring our exceptional customer service and desire to make you another satisfied customer. You have so many better things to do than worry about termites at your house. Let us keep your days worry-free so you can enjoy the fun life on the beach that you deserve. Sounds great right? We think so, but we can show you better than we can tell you. Learn firsthand what so many others in the area know already and call us when it’s time for pest control service. We offer treatment solutions for every homeowner in the area, no matter how severe the problem. We also treat all three of the major termites that exist in the state, as well as the Formosan termite that so many people see at their home. We stand behind our work and never cut corners to finish a job quicker or at less cost. our goal is complete termite elimination and customer satisfaction. Schedule your free pest control service consultation and we’ll help you learn more about our thorough termite service! End of Spring Beginning of Summer (July) Drywood Termites begin removing their droppings from the galleries they have created within the wood. Pellet production of the colony stays consistent through this time but is more noticeable by the homeowner. Every pellet pushed out by the termite colony is a portion of your wood just digested and eaten by a termite. The termites are pushing the little droppings out of the colony to empty the galleries for the reproductive alates (swarmers) to pack within. 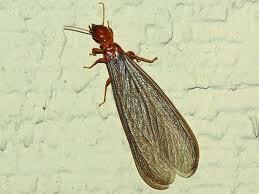 Swarmers are the winged termites that exit the colony end of summer/beginning of fall (September/October). These flying termites exit the colony to enter into new pieces of wood and create their colony as queens/kings. Exiting Winter (March/April) while it is still raining Subterranean Termites swarm. 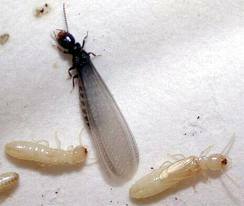 These winged termites exit the colony en mass in hopes of finding suitable wet soil/ground to burrow. Subterranean Termites never see the light of day except for the swarming day. The Queen, King and all of the workers are underground. Subterranean Termites build mud tunnels through foundation cracks in the slab of your home to reach the wall studs made of wood. These hidden destroyers consume large quantities of your home without your knowledge. Often they are only discovered when a mature colony has produced a swarm indoors. 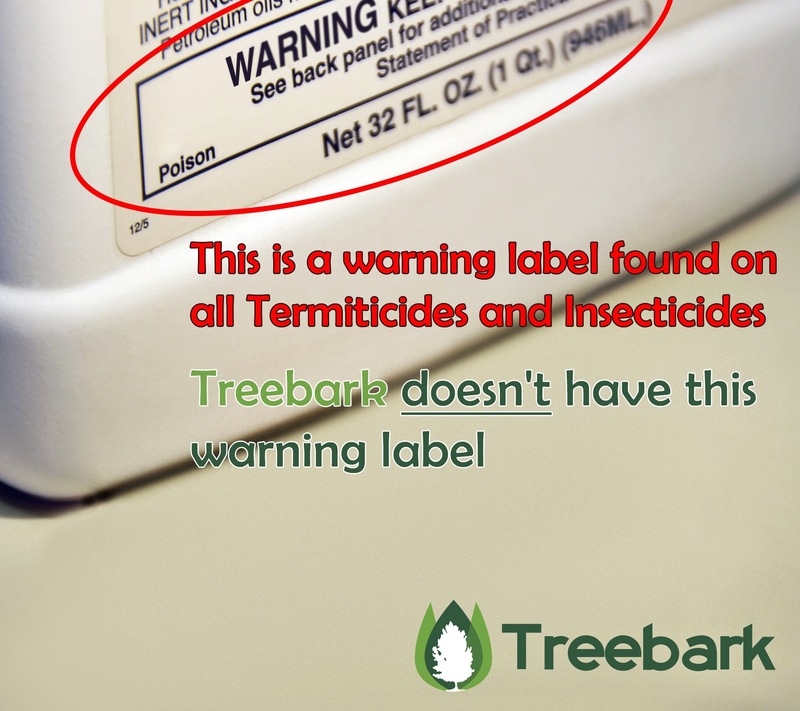 Why Treebark Termite and Pest Control? – Naturally Derived Compound Chlorantraniliprole Based on the Organic Insecticide Ryania Speciosa’s mode of action. – Mimics Mother Nature’s Way of Controlling Pests by attacking Ryodine Receptors of Insects, Just like when the tree senses its under attack it produces compounds of insecticide. – Stops Termites From Feeding – Wood Damage Stops within Hours. The Chloranthripole clone of the Ryania Tree Compounds Destroys The Mandible of the Termites Preventing Feeding. – Free Organic Pest Control Service included with Treebark Final System Install. That’s right not only do we provide Naturally Derived Termite Control we specialize in Organic Pest Control Services. – Reduced Risk Pesticide – First in Nation for this Program – NO SIGNAL WORD. That means there’s less risk towards humans and pets. Less than everything else on the market. This Indian Lady Downed a bottle of Undiluted chlorantraniliprole and was fine I don’t recommend you drinking pesticides but it is interesting to know that someone has drank an entire bottle of concentrate without suffering fatal consequences considering we use 1/2 the bottle and mix it with 25 gallons of water. – Fumigation Gas can get trapped and in unfortunate cases results in Accidently Killing People. That’s a Pretty Harsh Worst Case Example, Here’s another about a boy in denver. The worst case with Treebark Final Service is I Miss Something and Have to Come Back. – People don’t talk about how often Fumigation’s Fail, (*8519.5 (b) Failed Fumigations). When it happens, they “redo” the entire process over for free. How Fun. I estimate 1 in 10 Fumigations Fail. That’s Been My Experience. Sue Me. – My Technicians are Live Scanned (Finger Printed), Drug Screened, Licensed, Bonded and Insured. Fumigation tarp guys are not required to submit to any of these things and there are reports of burglaries because of it. Yes, you might trust the field representative you’re speaking with but do you trust the tarp guys who show up to actually do the work? Remember, their fumigation tarp guys are going to be inside your home, opening your cabinets and drawers. Aaron Cunningham, all opinions expressed here within are my own. My Links Speak for themselves.